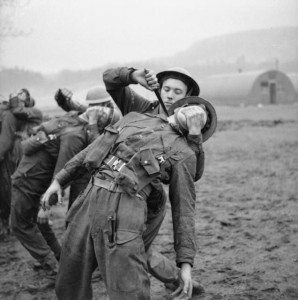 Close Quaters Combat (CQC) is the general modern term used to describe the better known Second World War term of hand to hand combat. Although the modern term is encompassing of hand to hand combat it has also come to include the use of firearms used in close proximity. CQC (Close Quaters Combat) has always been part of warfare, originally called Mêlée it was more akin to an unorganised Close Quarter Battle (CQB) where two warring sides would engage and mix at abnormally close ranges with little or no direction. The Mêlée is inclusive of foot solders (infantry), naval, and armor (horse back). Although air warfare has its own share of close quarter battles this was generally termed “dog fighting”. Due to the influence of modern technology air warfare has predominately become operations of long range warfare. 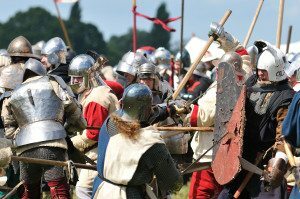 The idea of training a fighting force to continue fighting even if they had lost their primary and secondary weapon source has been around since man first began tribal warfare. 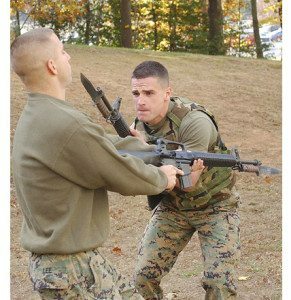 This has taken the form of techniques or drills sometimes called Close Quarter Tactics (CQT). These are specific scenarios that can be used to experience specific attacks, allowing the teacher a point of reference from where they can direct the student, and a point in time that can be studied. The problem with this being first of all you have to teach. Teaching can be long and protracted, needing to start with the basics and progress to the advanced. The method does work but can take a lot of concentrated effort in the early stages. As time and experience progress the ability of the combat practitioner increases. The ability of CQC (Close Quaters Combat) can be further developed by the inclusion of specific weaponry such as knives, clubs, batons, and in modern Close Quarter Tactics (CQT) side arms and primary fire arms such as assault rifles, as well as improvised weapons such as entrenching tools. The major difference in the general CQC (Close Quaters Combat) training arena of the western world came when W.E. Fairbairn and E.A. Sykes developed the Fairbairn / Sykes fighting knife and associated fighting method. This was a revolutionary fighting system for its time, but it was more or less still technique based. Other modern military fighting systems are KAPAP an acronym of Krav Panim el Panim, meaning “Face to Face Combat” (Commonly known today as just Krav or Krav Maga), Chinese Sanshou which is developed from traditional Gung Fu, and even Russian SAMBO another acronym for SAMozashchita Bez Oruzhiya meaning “Self-defence without weapons” taught to the Russian military in the 1920’s are all again technique based. When you take the requirement to teach a large fighting force to defend itself the use of natural instinctive reactions will speed up the learning process over the discipline dependent systems. By functionalising the natural reaction as in Krav we see a speeding up of the learning process, but this is still mainly technique based. Systema on the other hand uses the natural instinctive reactions to a distressing situation coupled to the correct use of breathing to aid in keeping the psyche calm and able to make rational decisions. Systema is more of a process of unlearning rather than learning, we all have the natural ability to protect ourselves, the body knows what it needs to do. The problems occur when we attempt to apply our knowledge to our instinct; this is where we become “stuck” as the forces of instinct and knowledge battle for supremacy. Systema encourages the instinct to surface and take priority over the knowledge which ends up as a support system that bolsters our ability to survive further than the initial reaction takes us. This concept is now entering the general training of western military CQC (Close Quaters Combat) training. In 2001 Sergeant First Class Matt Larsen, Established at Fort Benning the US Army Combative School. Although training involved basic techniques, the majority of the CQC (Close Quaters Combat) training was based around concepts coupled with the basic technique. The technique methodology was simplicity and repetition throughout the training day. This causes the high development of finely tuned intuition, which sometimes is mistaken for instinctive reaction. The lessening of complexity will not fully allow a truly instinctive art to emerge, but it is a method of getting closer to that goal of a fully self contained combat operative.